Cognitive systems solve problems the way humans solve problems, by thinking, understanding, reasoning, reacting and interacting. Through simulation of human thought processes, the goal of cognitive computing is to create automated IT systems that are capable of solving problems without requiring human assistance. 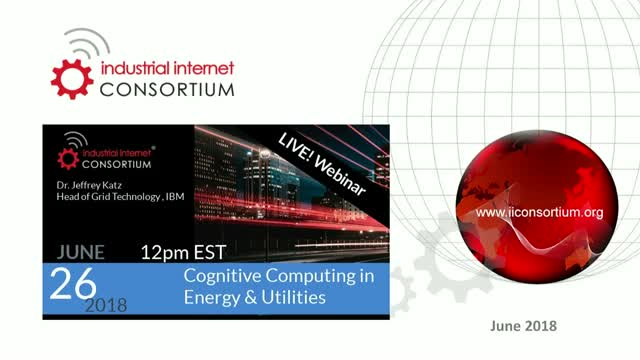 This webinar will explore the application of cognitive computing techniques within the energy sector: increasing the accuracy of outage predictions, optimizing uptime, and enabling customers to monitor and control their monthly energy consumption. The cybersecurity landscape is complex and ever-changing. Therefore, deciding where to focus your security resources can be a challenge. Security maturity modeling provides a path for communicating with business stakeholders and a strategic step to attaining the necessary support to move forward with a comprehensive security roadmap. What is your Security Maturity Level? Dr, Chellury (Ram) Sastry of Tata Consultancy Services presents a case study on Energy Management Solution for Commercial Buildings and Industrial Facilities at the Global Event Series in Cary, NC, USA. Terry Yates of the Town of Cary, NC presents a case study on Improving Response Time & Customer Experience Using Building Automation Systems at the Global Event Series in Cary, NC, USA. Jason Mann of SAS and Ann Perreault of Honeywell present the SAS Keynote at the Global Event Series in Cary, NC, USA. Stan Schneider of RTI presents the RIoT Keynote at the Global Event Series in Cary, NC, USA on February 15, 2019. Sven Schrecker of LHP Engineering Solutions presents the IIC Keynote at the Global Event Series in Cary, NC, USA on February 15, 2019. Samples of how IIC members are monetizing the Industrial Internet and how IIC membership is impacting their success. IoT is turning mining into a safer and more productive industry. The technology involves connecting machines, fleet and people with sensor technologies that transfers and receive data over a network. Digital Transformation through IoT that focuses on digital exploration, agile mining operations, connected assets, and next gen safety brings significant benefits to mining companies and mining technology suppliers alike. Mining organizations that don’t embark on IoT-enabled Digital Transformation will find it more challenging to compete in uncertain resources cycle. With more than 80% of IoT projects not progressing beyond POC stages according to Gartner, there is a disconnect between IoT technology and IoT capabilities. This stems from a technology-centric approach to IoT that focus on connected “things” and less on the expected business outcomes. A July 2017 McKinsey study found that 70% of their respondents identified “integrating IoT solutions into existing business workflows” as a capability gap. The IoT challenge that mining companies now face is less of a technology problem and more of a business process problem. This webinar presents a framework that provides the business architecture for using IoT that connects IoT technology to operational capability and business outcomes. The I2OC framework focus on aligning IoT technology with benefits such as increased asset availability, reduced downtime, reduced costs, increased efficiencies, and improve safety and governance. Pieter uses a practical mining example to present the I2OC framework. The beginning of a security strategy starts at the end – securing your IoT endpoints. Endpoints are everywhere in the Industrial Internet of Things (IIoT) landscape. Without proper endpoint security, IIoT systems may put your organization or the greater public at increased risk. Plus, the viability of the IIoT depends on proper implementation of an endpoint security strategy to counter the growing and ever-changing threats. During this webinar, the editors of the Endpoint Security Best Practices Whitepaper will discuss this important document, customer use-cases, and the core components of a comprehensive, IIoT solution. Explore the role of the IoT in the mining industry. From big industry to incubators and startups -- many organizations are engaging globally via innovative ecosystems, testbeds and tech hubs for education, awareness, and best practices. The emergence of next generation distributed energy resources (solar, wind, battery) and storage technologies have challenged the capabilities of traditional, central-station power grid systems -- until now! Advances in embedded systems, analytics, machine learning and time-sensitive networking allow tightened integration, thereby digitizing the grid and addressing technical challenges previously impossible to solve. This webinar will discuss new approaches to address operational challenges by integrating communications and control technology directly to the grid. Explore the IIC Testbed Program and learn how the award-winning Microgrid and TSN testbeds provide a rigorous testing environment for solving integration challenges in a multi-vendor, real-word environment based on industry standards (DDS, OpenFMB,TSN) and other emerging industrial IoT capabilities. Your interconnected devices are only as strong as the weakest link. Choosing a connectivity solution without a robust security framework will leave your data and the system that supports it exposed and vulnerable. Fortunately, there are tools in place that can help address these challenges. This webinar discusses the security-related benefits of applying reference milestones that the IIC has published over the last two years in industrial systems: the Industrial Internet Reference Architecture, the Industrial Internet Security Framework, and the Industrial Internet Connectivity Framework. Jason Mann & Michelle Null from SAS Institute give an overview and show walkthrough of the 2018 SAS Global forum with customers and partners. GE Transport's Adebayo Onigbanjo, Senior Director for Global Transport, shares a view of comprehensive solutions overview for fleet management and maintenance. The advent of connected devices and platforms are driving the digitization of manufacturing. Although systems and production facilities have long been automated and connected, today’s Smart Factory is adept, can learn from data and adjust in real time. The industry has evolved by bringing together the physical and digital world, creating torrents of data. In order to unlock the full potential, you’ll need architectures, frameworks and implementation plans. This webinar will give you an overview of available tools and guidance on getting started. As connected devices become ubiquitous, a need arises for those devices to move and interact seamlessly among different domains in a trusted manner. Blockchains may provide foundations for systems that require coordination where trust and authority are not centralized. This presentation will provide an overview of blockchain technology and suggest potential applications in the field of distributed, connected devices in industrial environment. The Industrial Internet Consortium is a global, member-supported, organization that promotes the accelerated growth of the Industrial Internet of Things by coordinating ecosystem initiatives to securely connect, control and integrate assets and systems of assets with people, processes and data using common architectures, interoperability and open standards to deliver transformational business and societal outcomes across industries and public infrastructure.